RancherMan & I don’t always eat dessert, but when we do it’s usually something quick & easy. I’ve simply cut berries in a bowl and topped with quick homemade honey-sweetened Whipped Cream, or enjoyed our healthier version of ‘ice cream‘ that uses frozen bananas and berries. Or even whipped up a quick chocolate pudding. All delicious, all quick & easy. The quick-read version: Spoon cherry pie filling into flour tortillas, roll tightly, place in baking dish, bake 350 degrees for 10-15 minutes. DONE! Making these cherry pie rollups are about as easy as it gets. First I whipped up my homemade cherry pie filling because it’s quick & easy & I had the ingredients. But you can totally use a can of commercial cherry pie filling to make it even quicker & easier! Now I pull out flour tortillas and heat them lightly in the microwave to make them easier to roll. 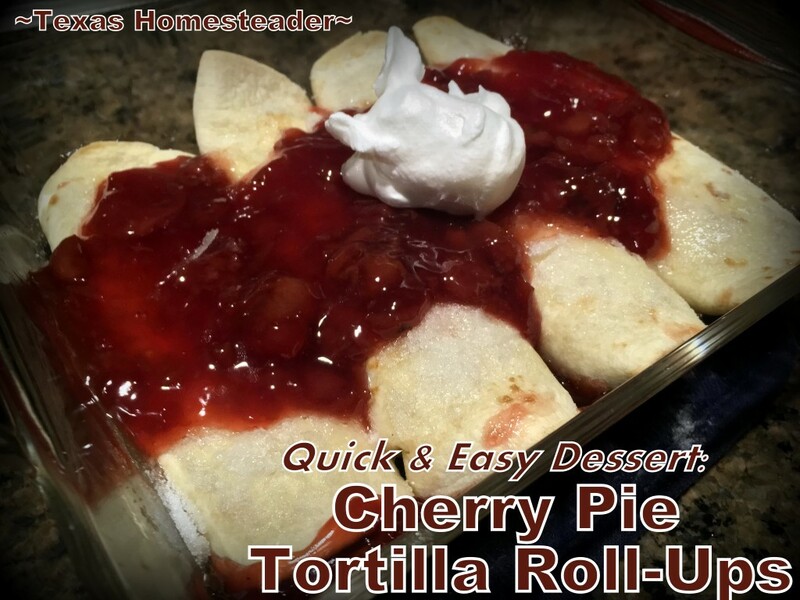 I put a spoonful of cherry pie filling on the edge of each tortilla & roll it up tight. Then I place each one seam-down in a small baking dish. When they’re all assembled I drizzle some melted butter and a sprinkling of sugar on top of all of them. I just like the finish this gives ’em but it’s totally optional. Now all that’s left is to toss ’em in the oven that’s been heated to 350 degrees Fahrenheit. It doesn’t take long, I bake them for only about 10-15 minutes. If you want to keep the edges soft you can cover them, but RancherMan prefers the edges to be lightly crunchy. So when I make these I always leave the baking dish uncovered. This entry was posted in Blog Posts and tagged Cooking, Recipes on September 16, 2018 by Texas Homesteader. I have a friend from the Ukraine and she taught me how to make blinly (kind of crepe-ish pancakes) and I do much the same thing with them. I have put cream cheese in with the fruit and they were very good. That looks easy and yummy! I wonder how it would be to make a cream cheese filling for inside with the cherry pie filling over the top? Thanks for the idea. I am sooooo trying this, maybe for a ‘grub Sunday’ at church. You are such a genius.